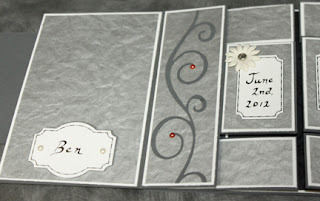 In addition to a traditional shower present for our daughter and to be son, I created a wedding mini album. I learned how to make it by buying Andrea Walford's tutorial quite awhile ago. 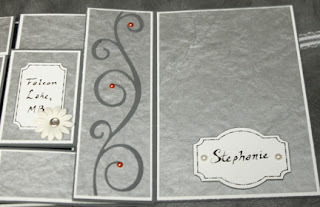 The big sections are to there to add pictures, hope you like it! Wow...wonderful design! I'm sure your daughter will love it. Thanks for playing along this week at Charisma....hope to see you next time too! What a wonderful card ! Very smart ! Everything in simplicity ! Magnificent work ! Congratulations ! Wow the style of card is stunning. Beautiful colour and detail. Thanks for joining us at MMCS Challenge this week. 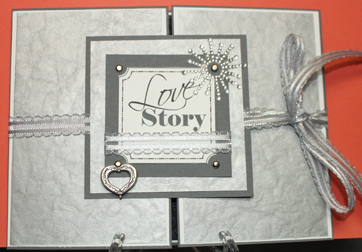 The text "Love story" is an embellishment in itself, and your choice of colors gives that feeling of elegance. Nice!! 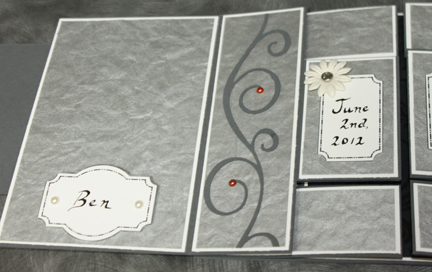 What a precious wedding mini album, this is so elegant.. 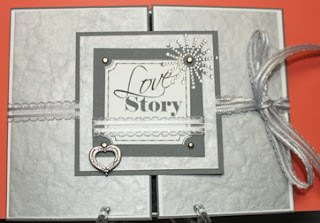 Thanks for playing along in PDS ribbon challenge and good luck! Wow! This must have taken ages to make and its so clever! Something to definately treasure too! A really stunning card, love the design. Thanks for joining Charisma this week. WOW! 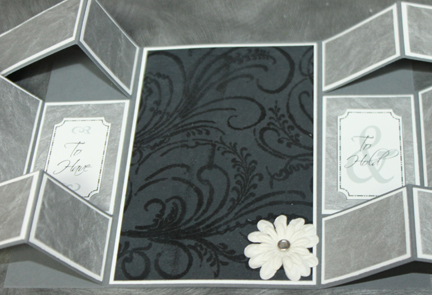 Fabulous fancy fold card/project. Thanks for joining the Fancy Folds challenge this week.